Potty Training Tips – I’ve known of many parents who half jokingly say, “sometimes it just feels easier to keep them in diapers!” Although potty training can be frustrating for both the child and parent alike, there are some great tips that can help you through this difficult process. Time intervals may help. 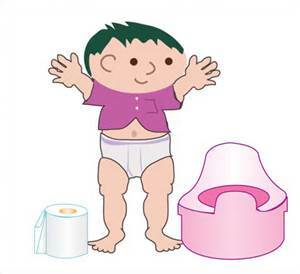 Determine a potty training time frame, for example every 20 – 30 minutes. Have your child sit on the potty at that time, even if they say they don’t have to go. Although every 30 minutes may sound like too quick of an interval, a short time span helps to ensure your child goes in the potty instead of anywhere else. Once they understand that they sit on the potty when they have to go to the bathroom, the interval time can be extended and then eventually phased out. Letting your child run around naked for a weekend may help the potty training cause. Sometimes children can be annoyed with having to remove their diaper and pants each time they are sat on the potty, especially if you are using short intervals. But for others, it’s the feeling of being wet, or having a bowel movement that trickles down their leg, that makes them realize it is better to do their business in the potty. Although this trick doesn’t work for all parents, there have been many that reported great success with potty training by using this technique to teach their children to go to the bathroom. Step 1: Child should show readiness and are able to tell you that they are wet/soiled. If the child isn’t showing interest, potty training becomes a much more difficult process. Step 3 – Child receives positive attention when they sit and again when they do something in the toilet (we make a really big deal about it!) – children love the positive attention and seek it! What makes this process work is that the child is ready, they know their peers are using the potty instead of diapers and they receive positive attention with success. Much of the success also comes from being consistent with our messages, the intervals and positive attention. When it comes to potty training, we at Alpha’s Preschool Academy, believe it’s important to remember that each child is different and the tricks you used with one child may not work with another. The bottom line is potty training takes time. Make sure your child is ready, make sure you as the parent are ready to devote the time to it and remember accidents will happen. But your little one will get the hang of potty training and it won’t be long before diapers are a thing of the past.